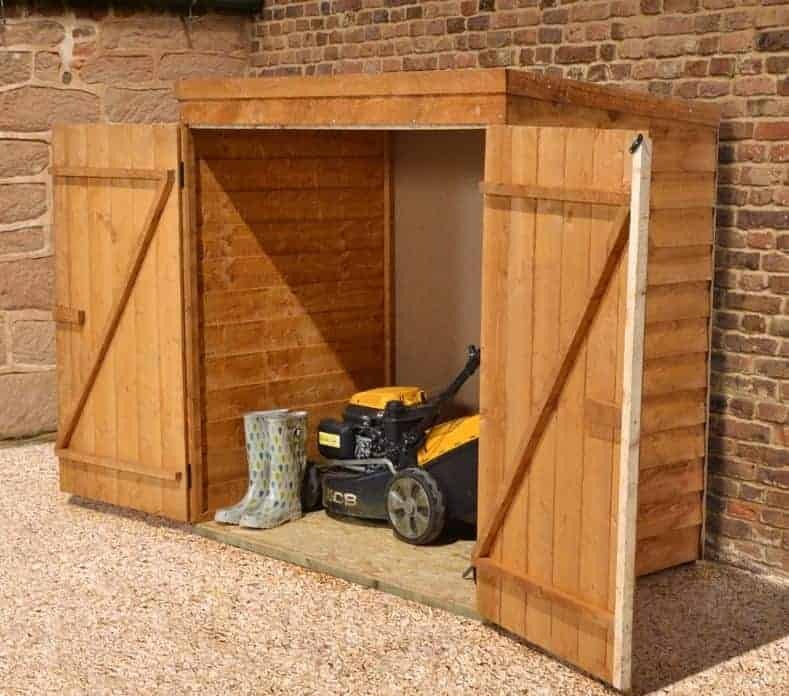 Your garden may not have enough spare room for a typical garden shed, yet still have things of value that need to be kept out of the rain, such as a lawn mower or selection of tools. 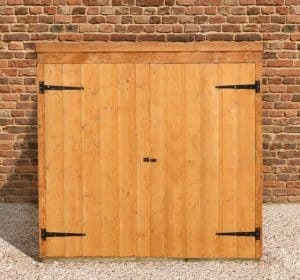 If that sounds familiar, this overlap tool store could have the answer to your garden storage needs. It’s very compact, and also very affordable, and yet you’ll be surprised at how much can be stored safely inside. 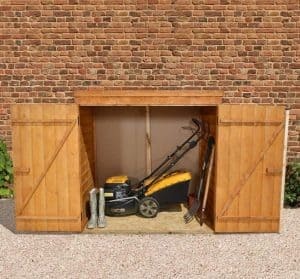 For example, it can easily hold the aforementioned lawn mower and still have room for a spade, hoe and much more. At the top of the store sits a pent roof covered with a strong mineral felt. This stops rainwater or snow from sitting on the surface and instead carries it harmlessly away. The same function is effectively carried out by the overlap cladding found on the walls, which means that you won’t have to worry about keeping the contents inside the store dry. The cladding has been given a basic dip treatment to preserve it in its initial phase, but it will need an annual retreatment. If this is adhered to, however, it comes with a 10 year anti-rot guarantee, which we feel is a very generous gesture. 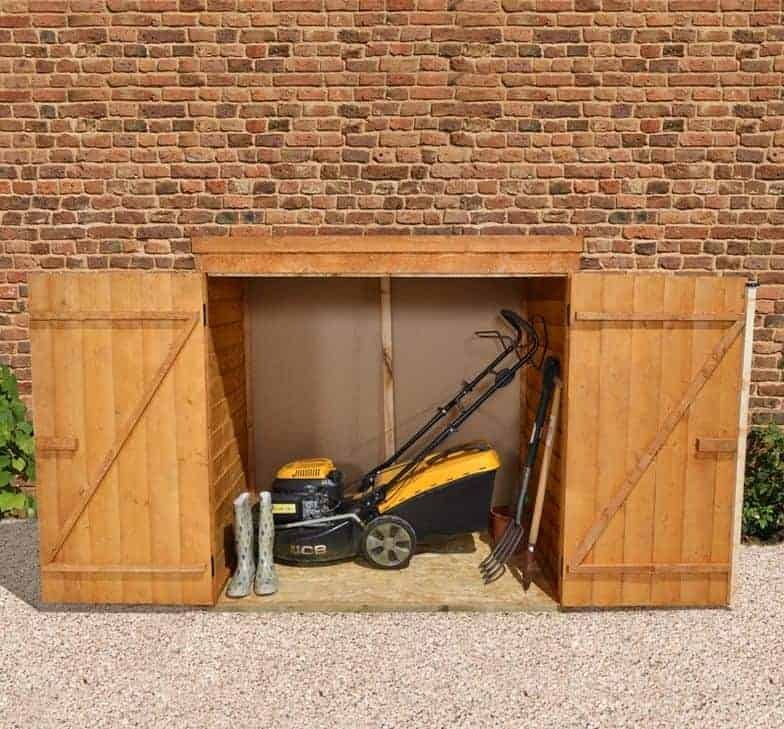 Whether you look upon this as a tool or lawn mower store, or a small garden shed, we found a lot to like about it. The first thing that struck us was its attractive look, with the overlapping wooden cladding giving it a traditional and almost rustic appearance. It certainly won’t look obtrusive in your garden, as some plastic or metal stores can do. It’s small and compact, and yet we think that this is also a positive. 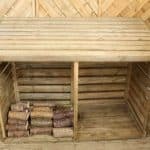 It means that owners of small gardens can get the storage facility they need without having to give up too much of their precious land. At the top sits a pent style roof covered in black mineral felt. 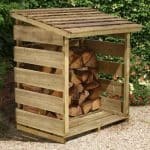 It’s very effective at carrying water away, and creates a ridge height of 1.47m and an eaves height of 1.39. The overall width of the store is 1.42m and the overall depth is 0.92m. The overlap cladding not only looks attractive it’s also highly effective at stopping rainwater from getting into the interior. We prefer to see tongue and groove cladding when possible, but we accept that this would have been impractical at this price range. The cladding itself is 8mm thick across all surfaces, and the frame is 28 X 28mm. These are both less than we often see on compact garden sheds, but it still felt reasonably strong when assembled. We’ll point out here that the back wall is made of OSB rather than overlap cladding, so it makes sense to have that positioned in the vicinity of a wall that will give it extra weather protection. The floor is also made of OSB, as is the roof, but we often see this on compact sheds. If anything heavy is to be stored inside you may wish to reinforce it. What we particularly liked about the floor, however, is that it features integrated floor joists that have been pressure treated. These give the floor added protection by elevating it above ground level which typically has a high moisture content. 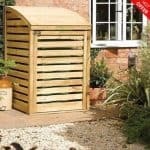 For a garden building as inexpensive as this, we were surprised and pleased to see that it came with a 10 year manufacturer’s warranty. To keep this warranty valid the customer is required to treat the timber with wood preserver on an annual basis, as it has only been given a standard dip treatment prior to being shipped. As the store is compact, carrying out this treatment should be neither costly nor expensive, so we highly recommend that the schedule is adhered to. One of the other stand out features for us was the large double doors at the front of the store. They occupy the full frontage, and so open to a width of 1.32m and have a height of 1.26m. 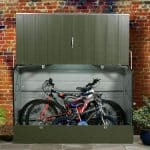 This means that it’s easy to move things in and out, and as an alternative to a lawn mower we feel this could be used as an all weather store to keep a bicycle in. It was also good to see that the doors were well braced, and so stronger than you might imagine. There are no windows, but with the doors open it’s easy to see what’s inside. We welcome the lack of windows, as this means that passers by will have no way of knowing whether anything of value is kept inside. This means that opportune thieves are far more likely to simply pass it by, if they notice the store at all given its compact size. Whilst it features a hasp and staple, there is no padlock supplied, so if anything valuable is to be kept within then this has to be an essential extra purchase. As well as the padlock mentioned above, which shouldn’t in itself be an expensive purchase, we would also recommend the purchase of an outdoor grade paint or stain. Whilst this isn’t available to be purchased with the tool store itself, it can easily be sourced via the internet or at any DIY store. By painting or staining the wood, the owner is protecting the timber from fading to a silvery grey colour over time, and can also help to stop the wood cracking. We found a good quality of components overall, although we would have liked to see overlap cladding used on the rear wall as it is on the others, rather than OSB. The pitched roof and overlap cladding both help to keep water out, and the pressure treated floor joists are also a good aid to durability. This is a small and compact storage facility, and yet this will be part of its appeal to many, and there’s still enough room for a lawn mower or bicycle to kept inside. Simply because of its easily manageable size, and the clear instructions, this is easy to install; although some parts do take a little encouragement to fit together. With a friend to help, this can be installed in around two hours. 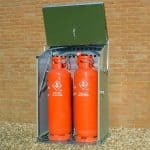 We feel that this provides very good value for money, particularly as it comes with the reassurance of a 10 year guarantee. Final Thoughts: Whatever size of garden you have, there’s likely to be room to fit this garden shed. Once in place it brings a lot of advantages, as it not only keeps your tools or lawn mower dry, it also makes them easy to find and retrieve. 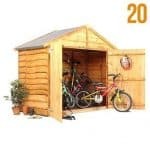 Because the double doors are so wide, it’s possible to store even quite wide items inside, which is why we think it would make an ideal bicycle store. 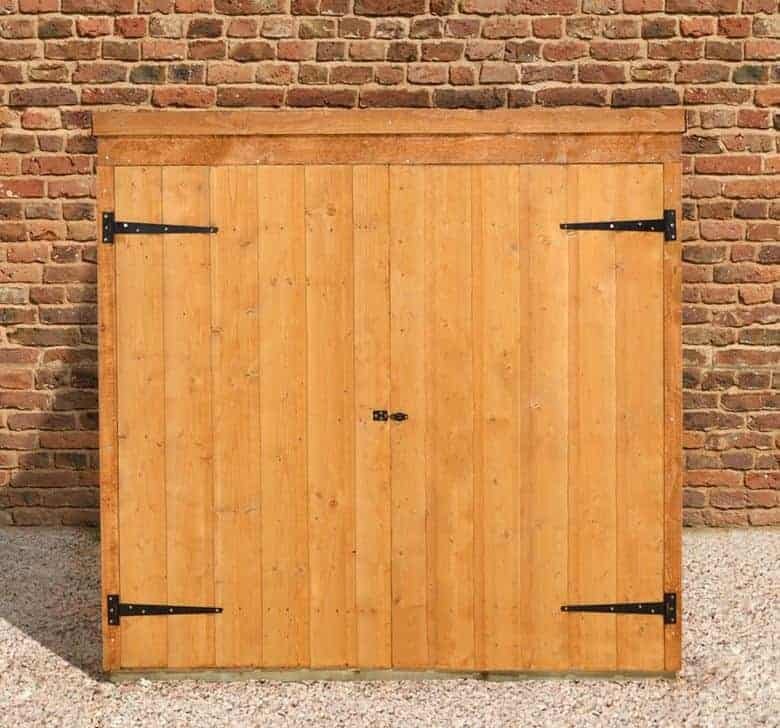 You may well want to add a padlock, of course, but this needn’t add more than ten pounds to what we feel is a very reasonable price for this small yet attractive garden building.